Home Announcements IE-CON 2018 is Here. Are You Ready to #Think Big? 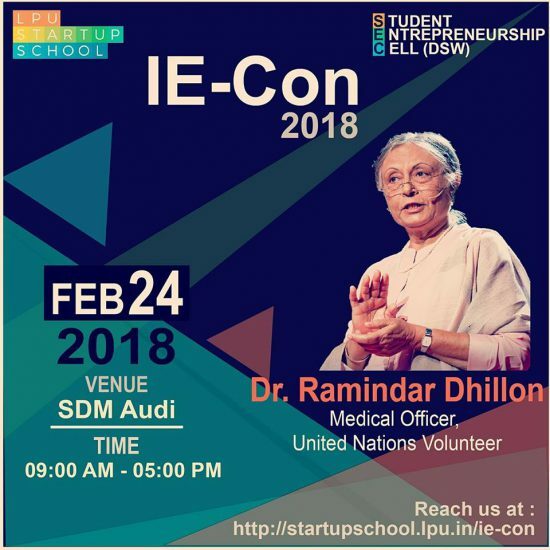 LPU Startup School is organising its 2nd Annual “Indian Entrepreneurship Congress (IE-CON 2018) on 24th Feb. This event will revolve around the theme “Think Big”. The event will witness 20+ Successful Entrepreneurs, Angel Investors, Venture Capitalists and Government Representatives. It is the biggest Entrepreneurship event in North India. The event is also hosting the largest B-Plan Competition named as “One in a Million” and the winner of this competition will get a funding of 1 MILLION USD i.e. 6,43,90,000 INR by F6S which is the world’s largest platform for founders. Also, the winner will get a cash prize of 1 lakh rupees. 100+ teams from various colleges including IITs and IIMs are vying for this funding amount and the cash prize. 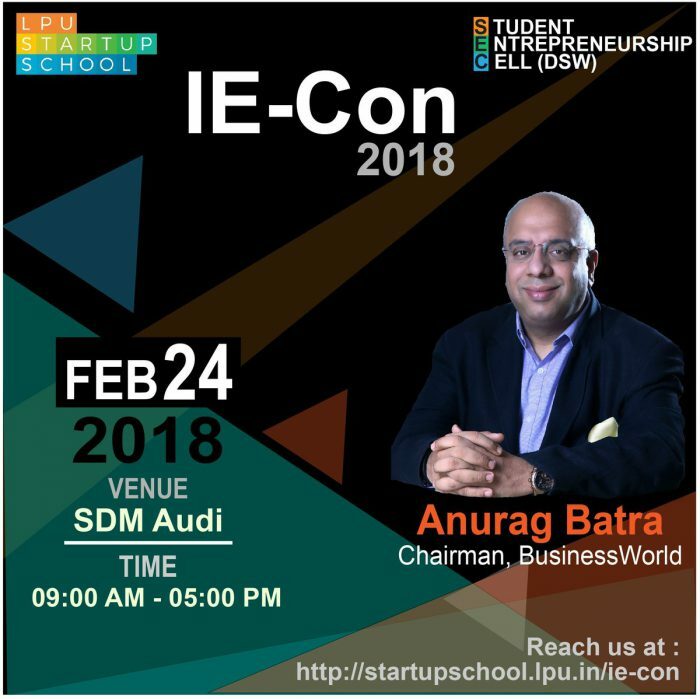 Moreover, there is a keynote session where top-notch speakers from corporate world will address budding entrepreneurs and help students discover the entrepreneur inside them. Panel Discussion is also scheduled so that students will get a better insight of Entrepreneurship. 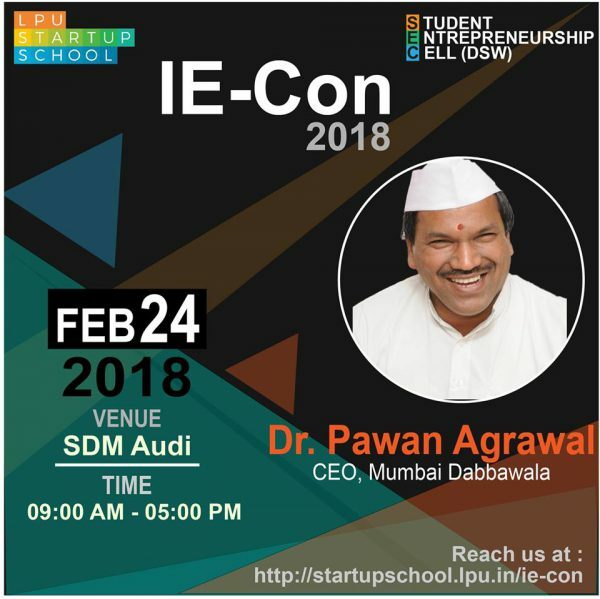 From a zero to everyone’s hero, a self-made Entrepreneur and one of the respected Business Magnate in India, Dr. Pawan Agrawal who is the CEO of Mumbai Dabbawala will help you with all your fears and failures. 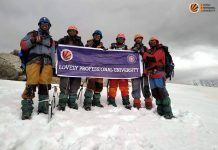 He will elaborate the ideals of passion, teamwork, dedication and hard work. Without the team with business qualifications how he made to six sigma is something really interesting you can learn from him. The “All in One” Entrepreneur who is the Chairman and Editor-in-Chief of Business World Magazine will be there to help everyone find an entrepreneur hidden inside them. He is the first generation entrepreneur. He did his B.Tech in Computer Sciences as most of us are pursuing in today’s tech world. 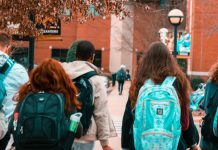 Thus it is a great opportunity to learn how he rolled himself as a serial entrepreneur, a journalist, and an eternal optimist after being a tech savvy. A doctor by profession, who believes that if you can adjust, adapt and negotiate, do stay on the path and never accept defeat. She holds over 40 years of experience in public health. She is involved with the UN in various capacities, including as a UN volunteer since 2013. Learn directly from her how she defeated her age with courage and determination to achieve her goal. This is not the end of the list many more business barons, successful alumni including Mr. Suresh Mansharamani (Investor), Mr. Pankaj Aggarwal (CEO of Hexi Cycles), Ms. Shilpa Surroch (Singer and LPU Alumni) and many more will be there. So to learn life lessons from success stories of these Business Moguls register yourself for IE-CON 2018.